Arteriviruses replicate in the cytoplasm and do not require the nucleus function for virus multiplication in vitro. 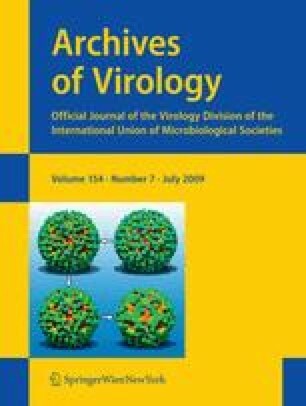 However, nucleocapsid (N) protein of two arteriviruses, porcine reproductive respiratory syndrome virus and equine arteritis virus, has been observed to localize in the nucleus and nucleolus of virus-infected and N-gene-transfected cells in addition to their normal cytoplasmic distribution. In the present study, the N protein of lactate dehydrogenase-elevating virus (LDV) of mice was examined for nuclear localization. The subcellular localization of LDV-N was determined by tagging N with enhanced green fluorescence protein (EGFP) at the N- and C-terminus. Both N-EGFP and EGFP-N fusion proteins localized to the nucleus and nucleolus of gene-transfected cells. Labeled N also accumulated in the perinuclear region, the site of virus replication. The LDV-N sequence contains a putative ‘pat4’-type nuclear localization signal (NLS) consisting of 38-KKKK. To determine its functional significance, a series of deletion constructs of N were generated and individually expressed in cells. The results showed that the ‘pat4’ NLS was essential for nuclear translocation. In addition, the LDV-N interacted with the importin-α and -β proteins, suggesting that the LDV-N nuclear localization may occur via the importin-mediated nuclear transport pathway. These results provide further evidence for the nuclear localization of N as a common feature within the arteriviruses. This study was supported by USDA National Research Initiative Competitive Grants Program (2008-35204-04634) to DY. Hakimeh Mohammadi is a scholarship recipient of the Iranian Ministry of Health and Medical Education.